His Holiness Sakya Trizin Ngawang Kunga was born in Tsedong near Shigatse in the Sixteenth Rabjong cycle, in the year of The Wood Bird, on first of the eighth Tibetan month (September 7, 1945). Sakya Trizin means "The Throneholder of Sakya". His Holiness is the 41st Patriarch of the Sakya tradition, one of the four major traditions ofTibetan Buddhism. The Sakya lineage is often closely related to Manjushri (the youthful prince known as the bodhisattva of wisdom). Vajradhara Ngawang Kunga Rinchen, the previous head of the Drolma Phodrang, and Sonam Drolkar, the sister of a renowned minister of the Tibetan Government, had four children. The eldest, a daughter whose name is Jetsunma Chime Luding, currently lives and teaches in Canada. The next born were a son and daughter who passed away in infancy. Immediately after His Holiness was born, birth, the sacred syllable letter Dhih (the letter of Manjushri) was written on his tongue with a special nectar made of saffron and many other things. During his birth, the entire sky was festooned with extraordinary rainbows. Soon afterwards, an eighty year old man with white hair offered a Thangka of long life deities, and also butter and cheese. The milk of one hundred dris (female yaks) was offered in a crystal vessel by a handsome youth clad in white, who claimed to have been sent by the chieftain of Tsedong. However, when enquiries were made later, no trace of this young man could be found. While His Holiness was an infant, his name was Ayu Vajra. Later, when his father gave him his first major initiation of "The Nine Deities of Amitayus" he was given his present name "Ngawang Kunga Thegchen Palber Thrinley Samphel Wangyi Gyalpo". When the family returned to the main Sakya monastery the next year, there was an extensive celebration of the anniversary of his birth. His Holiness 41st Sakya Trizin is the reincarnation of two great Tibetan masters: a Nyingmapa lama known as Apong Terton (Orgyen Thrinley Lingpa), who is famous for his Red Tara cycle, and his grandfather, the 39th Kyabgon Sakya Trizin Dhagtshul Thrinley Rinchen (1871 - 1936). The first indication that His Holiness was a reincarnation of Apong Terton occurred when a Dakini prophesied to Apong Terton that he would hold the throne of Sakya in his next life. When his parents asked him when he was a very young child where he came from, he answered that he came from far away and that his home was a tent. When he learned to talk, he spoke in Golok dialect, which was the dialect spoken by Apong Terton. Later on, in 1949, Apong Terton's son came to visit the Khon family, he told Vajradhara Ngawang Kunga Rinchen, "The great Terton purposely took birth in the Sakya Khon family to uphold the Sakya doctrine. I have no intention of requesting his return." When he met a disciple of Apong Terton called Sheija, His Holiness repeated a piece of advice given to him in the same words that Apong Terton had spoken earlier. He even called him Thubten Sheija. Only Apong Terton and a few close people had known that Thubten was Sheija's first name. There were also many other signs to show that he was the reincarnation of Apong Terton. On the day of His Holiness' birth, someone offered an image of Guru Padmasambhava. This is considered to be an auspicious sign and a further indication that he was the reincarnation of Apong Terton. Another auspicious connection is the fact that during his first meeting with Jamyang Khyentse Chokyi Lodro, he received the transmission of the complete cycle of Longchen Nyingthig teachings from him. And when His Holiness was about seven or eight years old, he went to a Mahakala Temple, which was rebuilt by 39th Kyabgon Sakya Trizin Dhagtshul Thrinley Rinchen, for the first time. During the restoration, he left a small skylight open in the upper southwest corner, so that light could enter the temple. Right away His Holiness asked, "What happened to the window? Where is the window?" "Somehow somebody closed the window," replied the old man beside him, with tears in his eyes. The old man had known 39th Kyabgon Sakya Trizin Dhagtshul Thrinley Rinchen and he knew that once there was a window. That is why the Sakyapas also believe that His Holiness is the reincarnation of 39th Kyabgon Sakya Trizin Dhagtshul Thrinley Rinchen. "If somebody is born into our family lineage, the former lineage of the reincarnation may be lost and these reincarnations don't get their monastery. This is because for us the family lineage is more important, it has priority. Our Khon Lineage does not need reincarnations. It is always passed down from father to son." Thrinley Paljor Sangmo appointed Jamphel Ponlop Kunga Gyaltsen as his first tutor and from him he learned the fundamental of the Tibetan reading, writing, memorization and the recitation of basic prayers. He learned chanting, music, ritual dancing, mudras and other subjects from his junior tutor Kunga Tsewang. After completion of these studies, a great celebration was held in which the Sakya Trizin officially entered both the Mahayana and Vajrayana monasteries to perform the traditional Sakya ceremonies. When His Holiness finished his studies at the Sakya Monasteries, he went to receive teachings at the Ngor E-Wam monastery. There at the age of five, he received the the Common and Uncommon Lam Dre (Tshod Shey and Lob Shey) teachings, bestowed upon him by his main Root Guru the great Ngor abbot Vajradhara Ngawang Lodro Zhenphen Nyingpo. In 1951, His Holiness made a pilgrimage to Lhasa. There at the age of six he was designated the throne holder of the Sakya Order by His Holiness the Dalai Lama. Accordingly, the next year a preliminary enthronement ceremony was performed in which he accepted the official seals of the office of the Sakya Trizin. Following the Parinirvana of his Root Guru Vajradhara Ngawang Lodro Zhenpen Nyingpo in 1953, the latter's Regent, Ngawang Tenzin Nyingpo, became another important guru to him. From this lama he received the initiations and reading tranmission (lung) for Grub-thab Kun-tu (The Collection of Sadhanas). And from Lama Ngawang Lodro Rinpoche he received the initiations and oral instructions relating to the Marpo Kor Sum (Three Major Red Deities), the Marmo Kor Sum (Three Red Deities), and the two main Sakya Protectors. At the age of eleven he again journeyed to Lhasa where he received teachings from His Holiness the 14th Dalai Lama at the Potala Palace. Also on this occasion he gave an extensive explanation of the Mandala Offering before His Holiness the Dalai Lama and a large assembly. This event led to his wisdom being proclaimed throughout Tibet. Another guru to His Holiness was the renowned Lama Jamyang Khyentse Chokyi Lodro, from whom he received many Tantric initiations and teachings, both Sakya and Nyingma. In 1957 he again received the Lam Dre teachings, on this occasion from the great abbot of Sakya, Vajradhara Jampal Zangpo, according to the tradition of the Khon Lineage transmission. In 1959 at the age of fourteen he was formally enthroned as the Sakya Trizin, this three-day ceremony being preceded by a seven-day Mahakala ritual. Representatives of the Dalai Lama and the Tibetan Government were in attendance. But by this time the political and military situation in Tibet had undergone a dangerous deterioration, and his flight to neighbouring Sikkim (a three day journey from Sakya) soon became necessary. Abandoning the holy principal seat of the Sakya tradition, which his family had occupied for nearly 900 years, His Holiness was able to take with him only the barest minimum of possessions and a few attendants. Arriving in India in 1959 at the age of fifteen, he was nonetheless able to found Ghoom Monastery at Darjeeling in the following year, and Sa-Ngor Chotsok Monastery at Gangtok in Sikkim and also to begin the task of reassembling the Sangha. Under the oversight of his aunt, his studies continued with various of the great Buddhist teachers of the Sakya tradition who had survived the catastrophe in Tibet. From such great scholars as the Abbots Tritso Rinchen and Serjong Appey Rinpoche he received extensive philosophical teachings in Logic, Abhidharma, Madhyamika, the Prajnaparamita, and "Discrimination of the Three Vows" (by Sakya Pandita). Particularly from Khenpo Appey Rinpoche, His Holiness received a thorough and detailed explanation of the Hevajra Root Tantra and other related teachings. And from one of the four Ngor abbots, Phende Khen Rinpoche, His Holiness received the initiation and explanation of Yamantaka in the Rwa Lotsawa Tradition, as well as the collected writings of Ngorchen Konchog Lhundrup. On account of political tensions between India and China during the early 1960s which were giving rise to military activity in the border regions, His Holiness then moved from Darjeeling to the relative safety of Mussourie in the Himalayan foothills near Dehra Dun. Around this time he taught the Lam Dre Tshod Shey at Varanasi. The Central Institute of Higher Tibetan Studies, a Tibetan Buddhist university, had recently been established at nearby Sarnath, and this was a time for regrouping and re-establishing of contacts for many Tibetan people who had been scattered and separated by the traumatic events of recent years. His Holiness, His Eminence Chogye Trichen Rinpoche (head of the Tsarpa branch of the Sakya Tradition and of Nalendra Monastery), and His Eminence Ngor Luding Khen Rinpoche (75th abbot of Ngor Monastery) were all present. This event was seen by many as a watershed, after which a new blossoming of Dharma activity came about. In 1974, to maintain the tradition of the Khon Lineage, His Holiness married Dagmo Kusho Tashi Lhakee, the daughter of the Minister of the King of Dege. That same year was highlighted by the auspicious birth of their first son, His Eminence Ratna Vajra Rinpoche. A second son, His Eminence Gyana Vajra Rinpoche, was to be born five years later in 1979. In 1978, His Holiness received the complete transmission of "The Collected Works of the Five Great Founders of Sakya" and "The Collected Tantric Works of the Omniscient Teacher Gorampa" from the Kyabje Dezhung Rinpoche. Then in 1980, His Holiness performed the opening ceremony of the main Sakya Monastery, Thupten Namgyal Ling at Puruwala. Later, in January 1988, on the anniversary of the parinirvana of Sakya Pandita, His Holiness consecrated and inaugurated the monastery and temple of Ngor E-wam Choden at Manduwala, near Dehra Dun. Meanwhile larger permanent premises for Sakya College had been built at Rajpur, and by the present time it caters for 130 monks, producing twelve graduates each year. 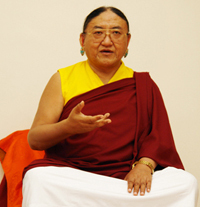 Thus from the difficult beginnings of exile from his homeland, His Holiness has worked ceaselessly for the preservation and successful reconstitution of Sakya's rich and profound Dharma heritage. Apart from these heavy responsibilities he has, in the course of his life so far, undertaken major and minor meditational retreats on twenty deities of the Sakya Lineage, given numerous initiations, written a large number of texts, and in particular has bestowed the vast Lam Dre teachings on no fewer than eleven occasions. Moreover he has not only been a beacon to his own Tibetan community in their time of crisis, but has taken an extensive part in making the Dharma available world-wide, travelling repeatedly and regularly to teach in many parts of the world. These have included Australia, Austria, Canada, Estonia, France, Germany, Hong Kong, India, Indonesia, Italy, Japan, Malaysia, Mongolia, Nepal, New Zealand, Russia, Singapore, Spain, Sweden, Switzerland, Taiwan, Thailand, United Kingdom, and United States. He is an unfailing source of wisdom and compassion for his fortunate disciples.